At the SXSW series of performances in March 2009, Joe Bonsall – the bouncing tenor singer for The Oak Ridge Boys said about fellow Oak Richard Sterban after a song featuring his super-low bass voice, "We have the only one of those on the planet." He was so right; the last remaining country quartet, The Oak Ridge Boys, continue their longstanding tradition of harmony. 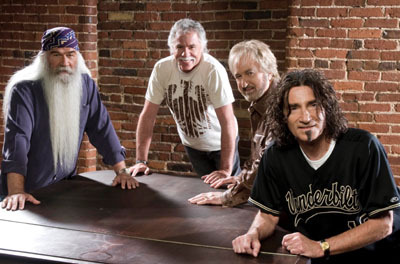 Since their inception in 1945 as The Georgia Clodhoppers to the present line-up beginning in 1972, Duane Allen, lead; Joe Bonsall, tenor; William Lee Golden, baritone; Richard Sterban, bass – along with multi-talented band members – The Oaks have kept the musical flame burning. One might ask, "What is the secret of their longevity?" It all goes back to the musical motifs of the Grammy award winning group. The first motif, of course, is the hit song. Duane Allen often says, "A person is three minutes away from a hit." Their monster hit "Elvira" - back in 1981 – is still their signature song; they do not grow weary of singing what brought them worldwide fame. "Elvira" lives on in pop collections and even soul and rap aficionados recognize the song if not the singers. Before "Elvira" made a person's heart to be on fire, "Ya'll Come Back Saloon" and "You're the One (in a Million)" paved the way on the charts. Since then, the hits kept on coming until country radio became homogenized. A second Oak motif is progressive development. The Oaks had CD's of their albums and cassettes (and, yes, 8-tracks) long before CDs became the dominant method of record sale. Strobe lights? The Oaks had pyrotechnics going on in their live shows long before it became stereotypical. In their recent project, 2009's The Boys Are Back, they take on the White Stripes with a hot version of "Seven Nation Army." An ORB concert usually includes some new material along with the standards the fans came to hear. The Journey was a venture into bluegrass – featuring Joe on some mean banjo. American Cajun music seems to be another element that appears on most of The Oaks' recordings. Something about Louisiana keeps cropping up – ever since "Leavin' Louisiana in the Broad Daylight" became a success. Some reference in Cajun style music or the actual state becomes manifest in their work. The guys will not stagnate. Of course, that does not always work; The Oaks tried a TV series, The Oak Ridge Boys Live from Las Vegas (from 1998) - a very slick, professional, highly-organized series with great music and guest performers (including Kenny Rogers). However, country fans just couldn't get past the glitz, glamour, magic tricks, and dancing girls. The show faded into the sunset and Las Vegas lives on. American values can be said to be another of The Oaks' endearing motifs. They sing America – two projects were devoted to such: 1989's American Dreams (with the late Steve Sanders replacing William Lee Golden) and 2003's Colors – complete with a cappella version of "The Star Spangled Banner" – and not "America the Beautiful" that some singers perform because they cannot hit the high notes when the "bombs burst in air." The Americana virtue is not an angle; Joe Bonsall's parents were military veterans and his 2003 book G.I. Joe and Lillie and song of the same title capture the pathos of their devotion to their country – and to each other. The quartet has performed before numerous Presidents and can make the most apathetic audience member ponder a while. Their gospel roots are an integral part to ORB survival. They began as gospel singers – progressively singing about nobody wanting "to play rhythm guitar behind Jesus" and singing about a place "where the soul of man never dies." Duane Allen has penned the famous "He Did It All for Me" – a song that continually is reprinted in church music collections. William Lee Golden's tryout song for the group was "I Don't Know about Tomorrow." The 2004 CD The Journey had as its title cut a gospel song written by Joe. Richard Sterban left behind a singing career with Elvis (who did his share of gospel music performances) to embark on a journey that has led him more to the forefront than the King could ever have done. Critics claimed The Oaks were deserting their faith when they changed over to country in the late 1970's and early 1980's; the change was based on finances; yet, if one looks at their recorded product, you will see gospel music still there. On their 1981 hit album Fancy Free, "I Would Crawl All the Way to the River" is pure gospel and has found its way on many gospel albums. On the follow-up album, Bobbie Sue (also from 1981), "Would They Love Him (Up in Shreveport Today)" concludes the session. The Oaks – like Jerry Lee Lewis – have always included both brands of music in their repertoire. The Gospel Music Hall of Fame has even added them to their long list of artists. The Oaks also know how to do Christmas. They have developed the Christmas concert to a fine art. Each year, a designated block of calendrical time is spent on primarily performing Christmas songs with an elaborate stage backdrop – complete with glistening trees, a Santa, fake snow, and special lighting. Seeing the group in a holiday setting is mesmerizing. Granted, the production is unashamedly sentimental and has a Disneyesque quality to it, but there are segments devoted to a brief rendering of their greatest country hits. Scrooge would come away a changed man had not Dickens beaten the Oaks to it. Constantly re-evaluating themselves, The Oaks with longtime manager Jim Halsey keep on presenting that harmonious sound that made them famous. Since the Statler Brothers are in retirement, that leaves Duane, Joe, William Lee, and Richard in the only spotlight that shines on a quartet who still puts out the sound though the years have slipped by them. The Boys are back? The Boys never left.